REVIEW – Klipsch is a maker of highly regarded speaker systems, yet I’ve only been acquainted with their high-end earphones—the 10Xi and the fantastic X20i. Until now, that is. 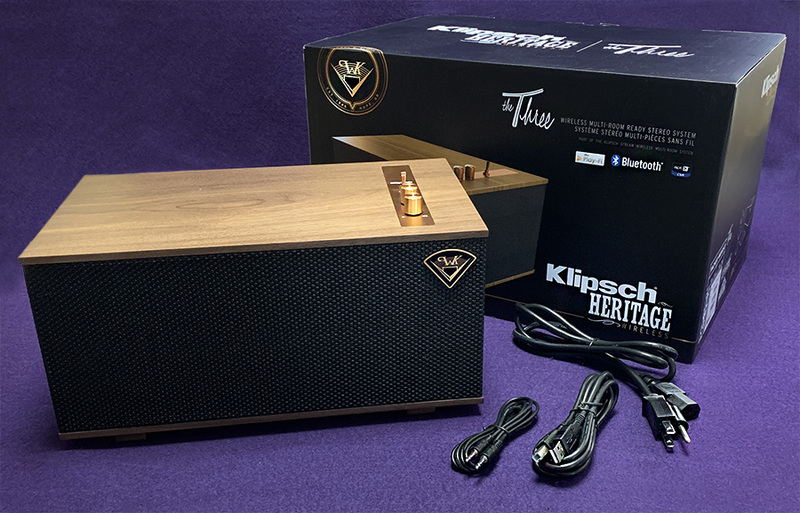 Klipsch has a line of speakers, amps and headphones under the Klipsch Heritage banner. Their speaker called The Three (is it the The Three?) 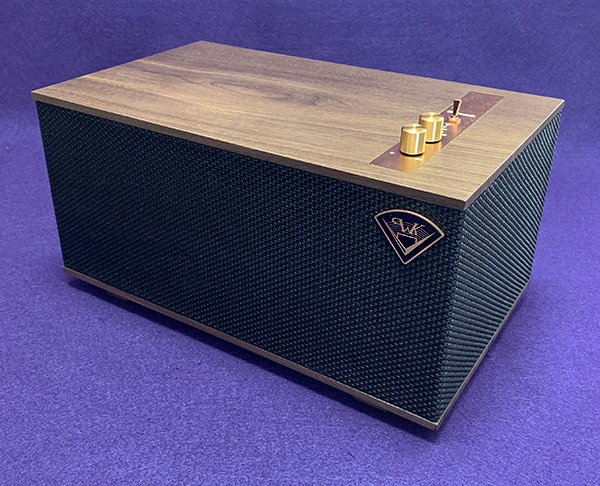 is Klipsch’s attempt at a premium wireless speaker. And OMG, what an attempt it is! Spoiler alert: The Three speaker is one of—if not the best—wireless speaker I have ever heard. Although not cheap, Klipsch has managed to match both build and audio quality of wireless speakers costing substantially more. 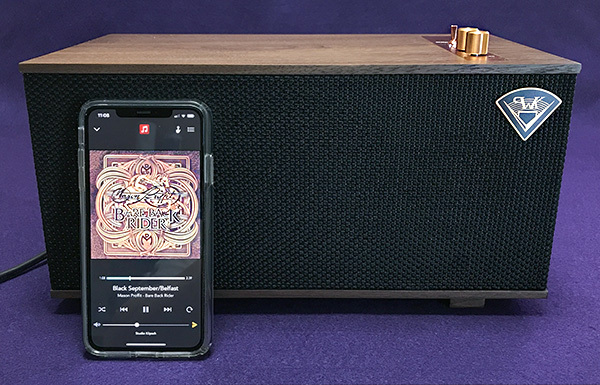 The Three speaker is a stand-alone tabletop wireless speaker that utilizes Wi-Fi (for the Klipsch Stream Wireless Multi-Room Audio System), aptX Bluetooth, DTS Play-Fi, and USB, RCA and AUX inputs and a built-in phono pre-amp. A remote control is included. 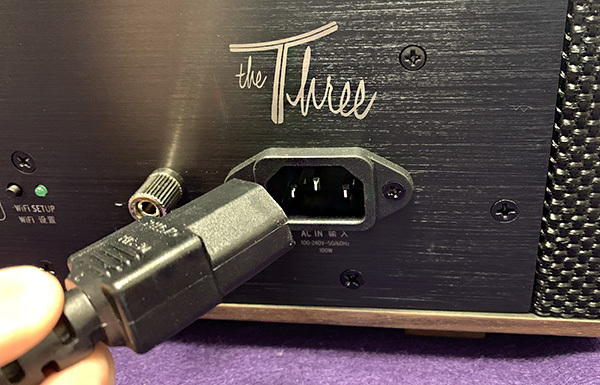 I’m going to give my overall impressions by going through The Three’s feature sheet provided by Klipsch and give my thoughts on each feature mentioned. 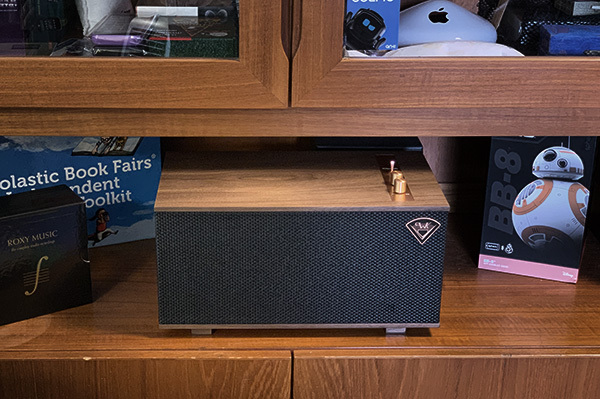 The Klipsch Three speaker’s design harks back to when speakers (and table-top radios) were meant to be seen as well as heard. 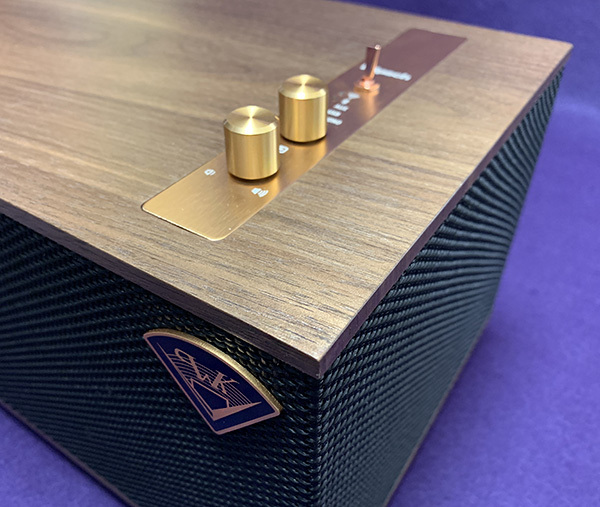 The Three has a wood and cloth (grill) exterior that says, “Don’t hide me.” Not only that, the buttons have that Klipsch copper look that is on many of their speakers. It’s a classic look that will never go out of style. 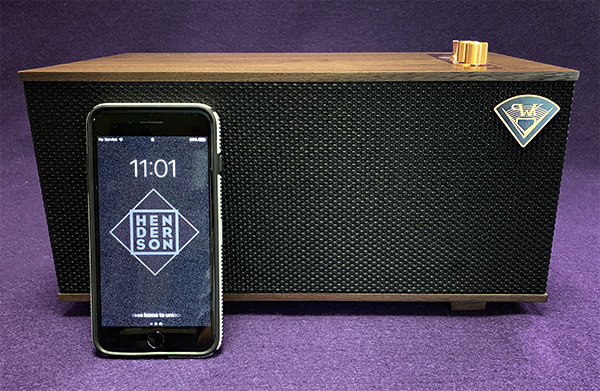 The top of the speaker features an on/off toggle switch, a volume dial and a rotary dial for switching between Wi-Fi, Bluetooth, AUX, USB and phone connections (read on for more about connections). These copper-colored controls fit nicely into the Klipsch design theme. 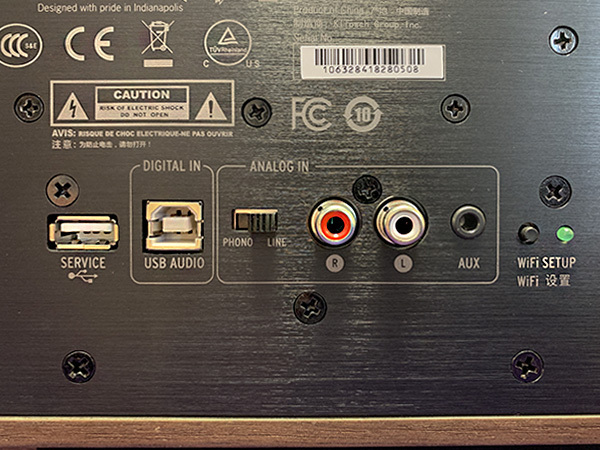 Switching between the connections is dead-simple but note that the wifi selection will not work except when using the Klipsch Stream app (explained later). Important: Although it can be easily moved room to room, The Three speaker is technically not a portable speaker since it has to be plugged in at all times—there is no rechargeable battery. Also, The Three is not designed to be an outdoor speaker. It is an indoor speaker. The Three speaker suffers from what every other single Bluetooth speaker has—or specifically does not have—stereo sound. Yes, The three plays stereo with its two full-range drivers, but they are in one box, so unless your head is right in front of the speaker, you lose any semblance of true stereo as you walk around. The only way to maintain stereo in a room is with genuine separate left and right speakers. Does that mean that audio quality is compromised? Not at all—despite that it’s a single box, the audio is widely dispersed and balanced, no matter where you are in the room. Let me start off by saying that I am not a bass-head. But oh—that bass! There are few wireless speakers that can put out the kind of bass that The Three can and still sound wonderful. Many Bluetooth speakers I’ve reviewed have decent bass for their size, but this speaker is in a whole ‘nother league. All this comes from a 5.25 in. long-throw woofer with two 5.25 in. passive radiators. 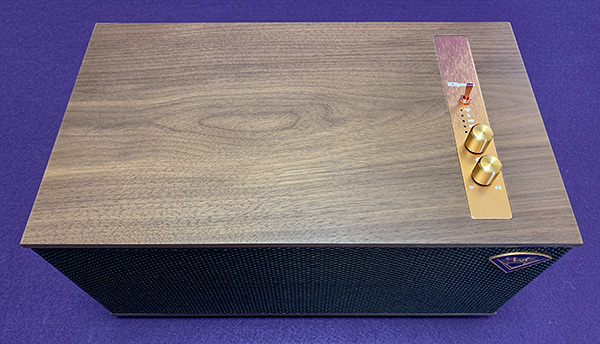 Note: A long-throw woofer has a bigger depth allowing it to move back and forth much more than a standard woofer, The effect is more air is moved to produce stronger low frequencies. I do not own any other Klipsch speakers, so I wasn’t able to test its multi-room capabilities, but I was able to use the Klipsch Stream app that controls the Klipsch Multi-Room System as well as The Three by itself. The app will play Amazon Music, iHeart Radio, internet radio, Pandora, Spotify Connect (requires Spotify Premium), SiriusXM (requires subscription) and more as well as music from a media server. The app was able to find and list all my music (and playlists) stored in the Apple Music app on my new iPhone XS Max. 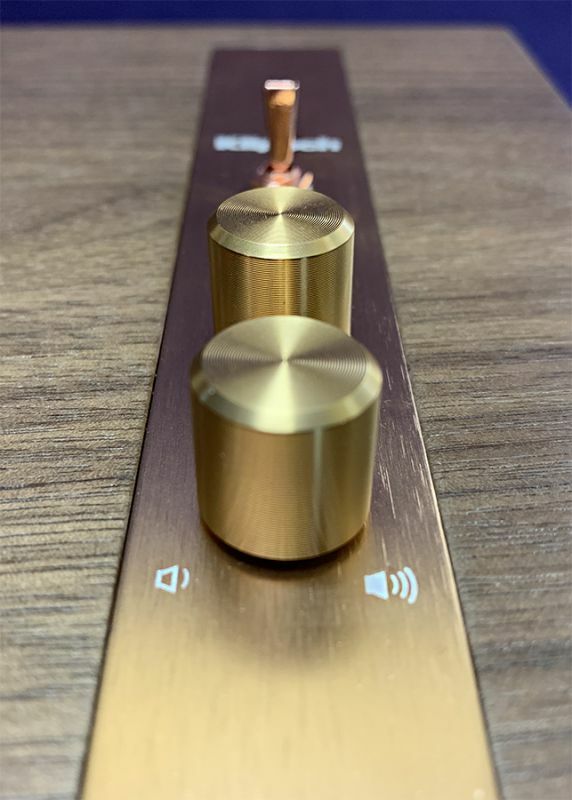 This kind of music control comes in handy when you can have different Klipsch wireless speakers in other rooms and have each one playing different or identical songs throughout the house. For its Stream App, Klipsch uses DTS Play-Fi wireless streaming technology. Play-Fi is a streaming service that many speaker companies use. What this means is that not only can all the previously mentioned services be controlled in the Klipsch Stream app, but other speakers (Klipsch or not) that utilize Play-fi will work with The Three speaker around the house. In other words, you are not locked into one audio ecosystem such as Sonos, for example. The Klipsch Stream app walks you through the Wi-Fi setup. It requires matching with a home network but it’s straightforward and works quite well. While using the Stream app, I found that some things were not as intuitive as I would have liked. There is also a slight delay when changing songs within the app. Being an Apple Music app user, I’m used to instant response times. The Klipsch Stream app lets The Three speaker sync with the Amazon Echo making The Three compatible with Alexa. This allows the use of voice commands and other smart features. The Three has 192kHz/24-bit decoding for playback of high-resolution audio from a PC. I was also able to connect to my Tidal Hi-res music account and play hi-res (better than CD) music through the app. Nice! 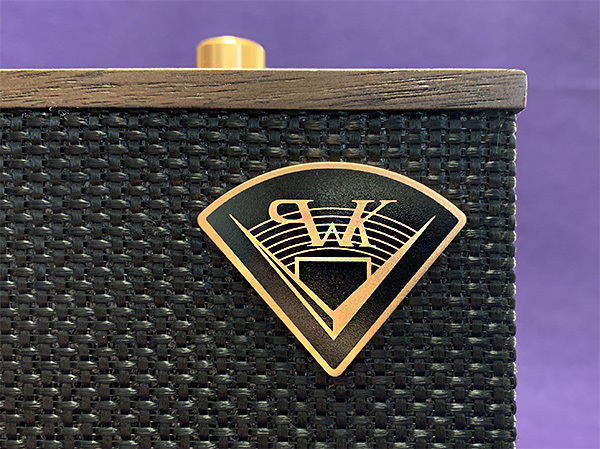 Note that Klipsch has just announced even more wireless speakers to its Heritage lineup: The Three speaker with Google Assistant built in as well as smaller, portable speakers. If you’re looking into starting a wireless music system throughout your home, you should include Klipsch as you compare systems. 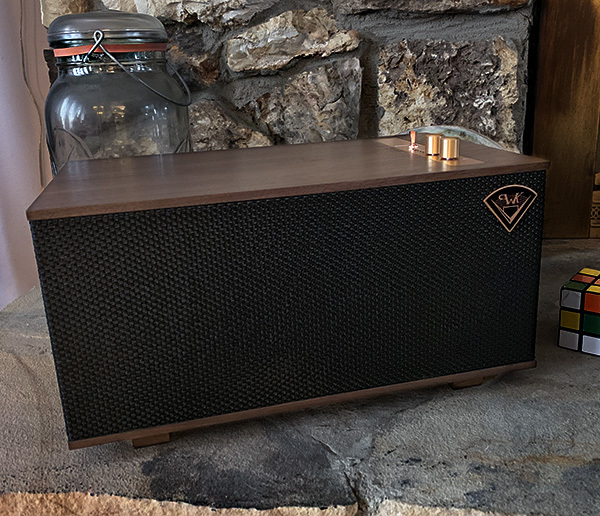 The Three speaker is capable of connecting through Wi-Fi (only for the Klipsch Wireless Multi-Room System), Bluetooth, RCA Analog, mini plug AUX, Phono (via its built-in pre-amp) and USB audio. 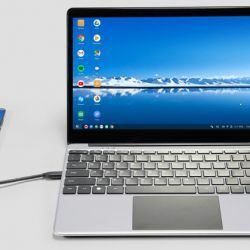 Basically, almost anything can be connected to The Three: Smartphone or computer (wired or wireless), CD player and even a turntable. USB (A to B) and AUX cables are included. Klipsch includes a remote that mirrors the functions on the speaker itself. The one caveat is that in order for the remote’s on/off button to work, the speaker’s on/off toggle must be left in the on position. As I said earlier, the Klipsch The Three speaker sounds great, whether it’s through Bluetooth, Wi-Fi or hardwired. Using the Klipsch Stream app sounds more full and much louder than using Bluetooth. As much as Bluetooth has improved, it still compresses music. Wifi has a much larger bandwidth than Bluetooth giving it the ability to stream lossless audio. A good example of this is Moby’s song, “Almost Home” from the “Innocents” album. Singer Damien Jurado’s eerie falsetto comes across as a heartfelt moaning. Plus, there’s a much more prominent bass line when heard through Wi-Fi—even coming from my iPhone. And like I said, it’s the clean and powerful bass that sets The Three speaker apart. From the same Moby album, the Andrew Weatherall remix of “The Perfect Life” features bass that can be felt as well as heard—this from a table-top speaker! Mason Proffit’s anti-war ode “Black September/Belfast” is hampered by less-than-ideal recording quality from the studio. The Three speaker manages to remove the higher frequency harshness that is apparent on many speakers, but it can only do so much to help the recording—a shame since this is an incredible song. For fun, I played one of my go-to bass songs, “Written, Forgotten” by Brian Eno. The out-of-place throbbing bass undercuts a pretty melody creating a menacing beauty that The Three speaker reproduces quite well. Each time I hear it, I have to remind myself that this is not a large speaker. The Three speaker can handle any genre of music: rock, classical, jazz, hip-hop, EDM, techno, you name it. Klipsch has managed to do what many speakers try and fail to do—make music sound as good as on similarly sized bookshelf speakers. Yes, the stereo separation you get from separate speakers isn’t there but if you are tight on space or a traditional speaker setup isn’t practical, The Three speaker may shock you by how good it sounds. The Klipsch Stream app has some minor quirks to work out. The Klipsch The Three speaker is not cheap, but this is a speaker that justifies its price. It will fill a room with pleasing audio, has many easy ways to connect to your music and gives you the freedom to be teamed with other Play-Fi speakers for a wireless home system that can compete with any proprietary wireless system available today. Source: The sample for this product was provided by Klipsch. Great review! I have this product, and can attest that it sounds *at least* as good as a $900 competitor that previously was my pick in this segment. The only fly in the ointment — as you note — is Play-fi. Bang on with that review. Cheers.